Like “Tête de Famille” this work appeared when I was playing with some wax and it is a small maquette of a mother lying back with her baby on her chest wrapped in her clothing. I cast her in bronze and she is rather charming. I have never made an edition of her but I can do so if anyone would like a cast. I would probably enlarge her and make my usual limited edition of 8. This little work was cast in 1989 by Burleighfield and was much admired when Charles Pinellis was visiting my studio when he was running Susse Fondeurs. He said ‘I’ll have that for my desk to sit with a little Degas and a Zadkine!’ I was much flattered by that remark but it went no further. At that time Susse were making the polished STERLING for me, which took one man in the foundry many months to perfect. He had made all the Brancusi posthumous works which were later to become the centre of huge controversy in New York. When Susse completed my polished works , they made two of them for me, I took one to a reception in the 14th arrondissement in Paris by the personal invitation of Madame Rhodia Dufet Bourdelle. She lived within the buildings of the Musee Bourdelle and was the daughter of the great Antoine Bourdelle who had worked for many years for Rodin before branching out on his own and becoming one of the greatest of all French 19th century heroic sculptors. She told me that she absolutely loved the polished “Sterling” and wrote me a wonderful personal letter about it, which I treasure. In 1989, I wrote to the surviving daughter of Antoine Bourdelle, the famous and prolific French artist and sculptor who was a friend and contemporary of Rodin’s when he was in Paris. I wrote about this bronze and sent her a photo of it having seen a Bourdelle exhibition in the Yorkshire Sculpture Park in Wakefield. She was, at this stage, 78. 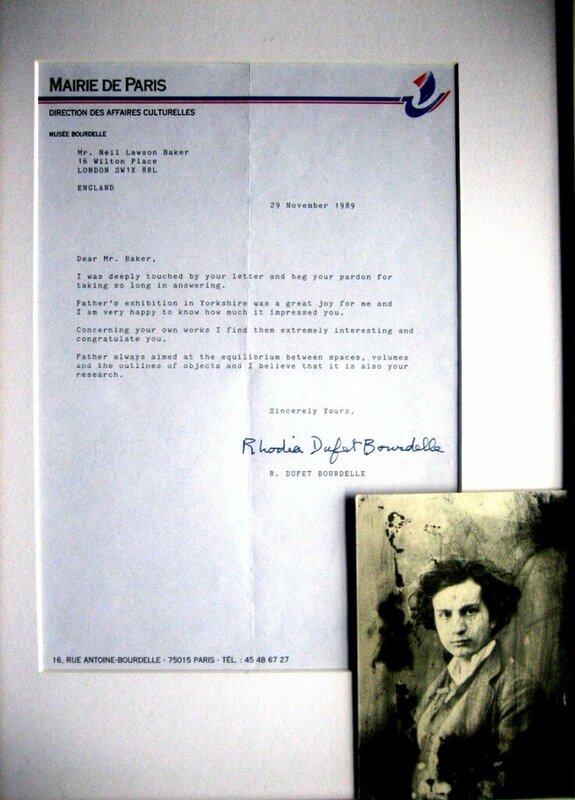 She had the kindness to reply to me and a copy of the letter is shown here, together with an enlargement. You will see that it is addressed from 16, Rue Antoine Bourdelle which is now the main Bourdelle museum in Paris which Rhodia curated and where she lived until her death in 2002. I was deeply touched by your letter and beg your pardon for taking so long in answering. Father’s exhibition in Yorkshire was a great joy for me and I am very happy to know how much it impressed you. Concerning your own works, I find them extremely interesting and I congratulate you. Father always aimed at the equilibrium between spaces. volumes and the outlines of objects and I believe that it is also your research.